Mediterranean Diet: the healthiest diet to lose 2 lbs per week. The Mediterranean Diet is the healthier diet in the world. Scientists confirm that the Mediterranean Diet reduces cardiovascular disease, increasing life expectancy and reduce overweight. Weight loss: 2 lbs per week (until reach your ideal body weight). Calorie diet: 2,000 calories per day. ♥ Nutrients: 15 % of calories:fruits and vegetables, both fresh and cooked. ♥ Proteins: 15 % of calories: meat, eggs and especially fish. ♥ Fat: 10% of calories: olive oil. For a Mediterranean Diet, we suggest you to follow this weekly diet menu with healthy and delicious meals (2000 calories menu). - 1 glass of skimmed milk or soy. - 1 natural orange juice. - 1 piece of seasonal fruit. - Pasta salad with tomato, fresh cheese, nuts, basil and olive oil. - Grilled chicken breast with lemon. - 1 slice of whole-wheat bread (12 oz, 40 grs). - 1 toast of bread with turkey. - Shaken of garlic with prawns and green asparagus. - 1 glass of skimmed milk or milk soy. - 1 slice of toasted bread with olive oil or jam. - Mashed potatoes with marrow. - 1 egg creme caramel. - 1 gelatin, or 1 skimmed yogurt. - 1 fillet of calf with slices of tomato with oregano or basil. - 1 slice of toasted bread. - 1 glass of skimmed milk or soy milk. - 1 juice of natural grapefruit. - Spinach boiled with grilled cheese. - 1 creme caramel, or 1 skimmed yogurt. - Salad of cabbage with carrot and yogurt sauce. - 2 toasts of bread with turkey. - 1 salad of seasonal fruits (strawberries, peach, grapes). - 1 sandwich with turkey and fresh cheese. - Salad with lettuce, tomato, cucumber, carrot, onion and garlic. - Potatoes omelet with tomato and peppers. - 1 piece of whole-wheat bread (12 oz, 40 grs). - Asparagus wrapped with Turkey and fresh cheese. - 2 toasts of bread. - 1 skimmed yogurt with cereals. - Boiled or roasted artichokes. - 2 slices of melon or watermelon. - 1 jelly, or 1 skimmed yogurt. - 1 toast of bread. - 1 portion of cereal (12 oz, 40 grs). - Roasted eggplant with little slices of meat, onion and garlic. - 1 sandwich with chicken and fresh cheese. - 2 turkey sausages accompanied by grilled onion. - 1 toast with light cheese. - 1 grapes juice or fruit season. - 1 slice of toasted bread with oil olive or jam. - Salad with lettuce, tomato and cucumber. - Mashed potatoes with chicken roast. - 2 slices of natural pineapple. - Organic tomatoes with fresh cheese without fat and basil. • Drink a lot of water, 8-ounce glasses of water per day (2 quarts, 1.8 liters). • A glass of red wine to accompany meals (optional). It's the pleasure of the Mediterranean Diet! • Don't eat fruits during meals. Eat fruits with 3 hours margin with the rest of food. 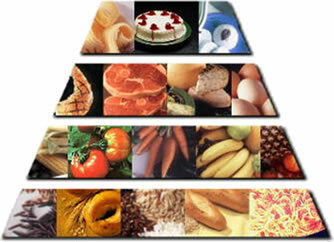 • You can replace all foods with one similar (see nutritional pyramid). ♥ Reduce Cardiovascular problems: the diet prevents clogging of the coronary arteries that supply blood. ♥ Anti-aging: the diet is rich in antioxidants (vitamins, minerals) that block the harmful effects of free radicals (ageing). Antioxidants are found in plants especially in fruits, vegetables, and whole grains.